Don’t have a customer login? Give us a call at 800-532-ROOF or email the Service Department for a demo. 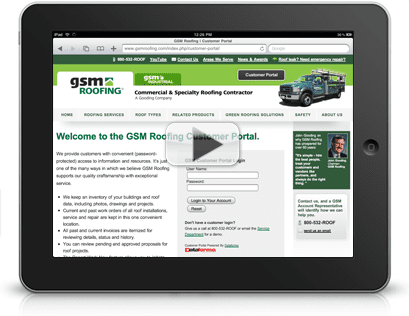 Welcome to the GSM Roofing customer portal, where you can manage your roofing assets with the click of a mouse or the tap of a tablet – anytime, anywhere. Our secure online portal is all about connecting customers to their most important roof data.